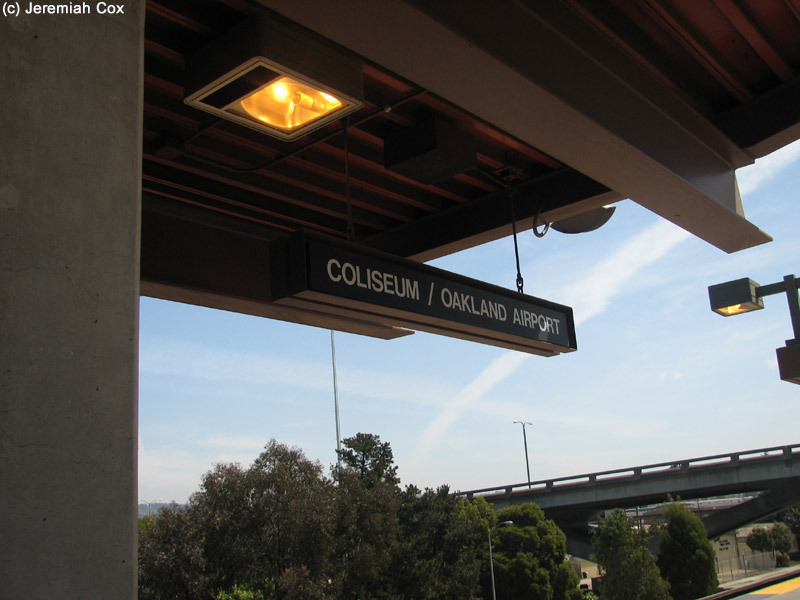 Coliseum (Oakland Airport) is one of the original BART stations that opened on September 11, 1972. 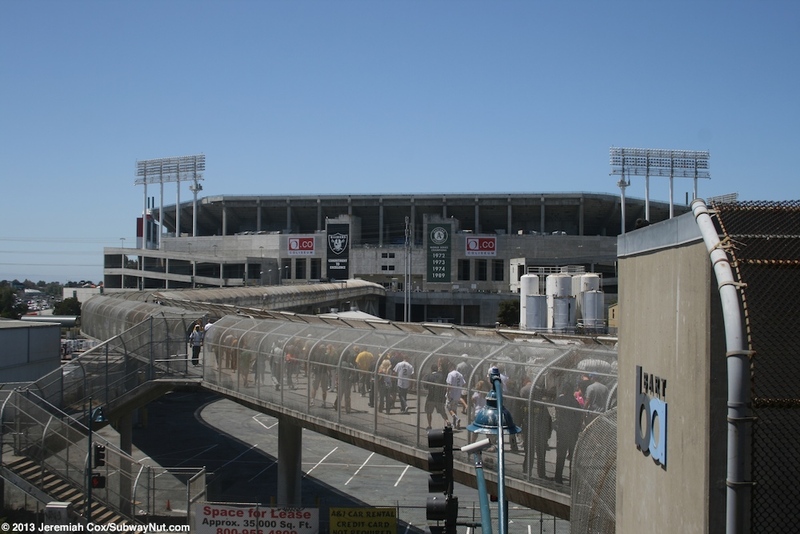 The stop serves the Oakland Coliseum and Arena located across a concrete pedestrian bridge west of the station. 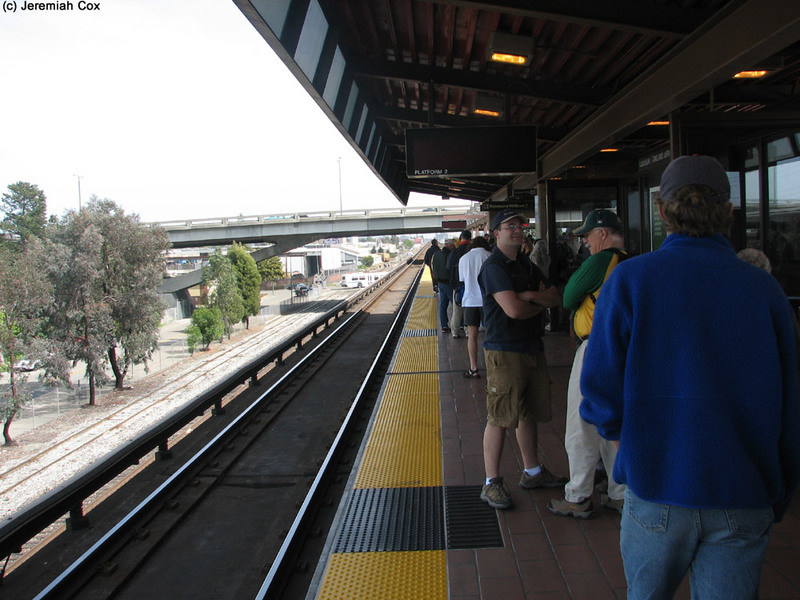 This concrete bridge crosses the tracks used by Amtrak's Capital Corridor (and bypassed by the Coast Starlight) and a ramp winds its way down Amtrak's Oakland Coliseum Station opened on May 25, 2005 that provides a southern connection between BART and the Capital Corridor instead of just at Richmond. 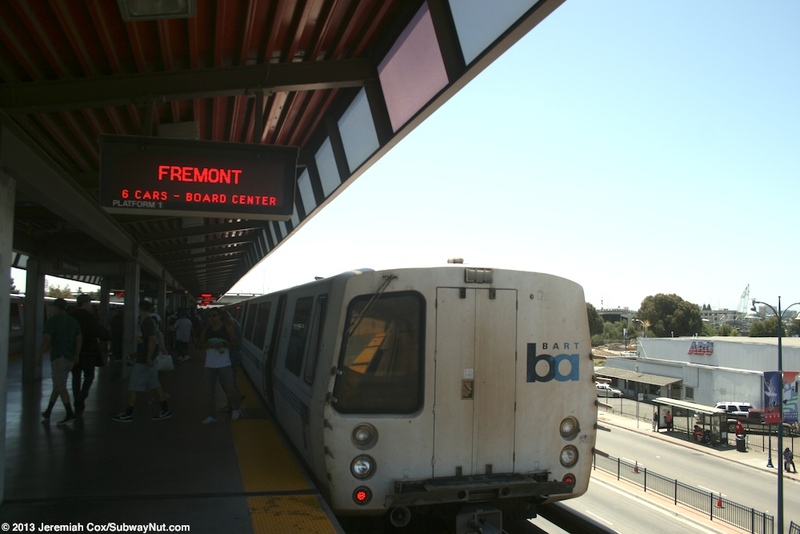 Signs at all entrances remind passengers (going to ballgames that could end late) that the fare gates close at Midnight although the last trains to Daly City and Richmond don't leave until 12:23/12:25am, to Dublin/Pleasanton at 12:35am and Fremont at 1:03am. 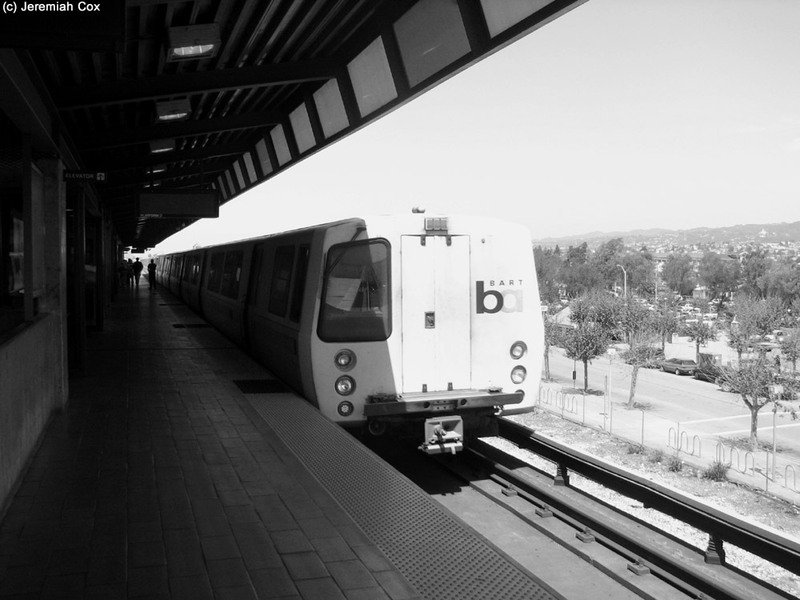 The current station is located on a concrete ariel guideway with an island platform that has a canopy over its midsection and an exposed platform with a central beam at each end. 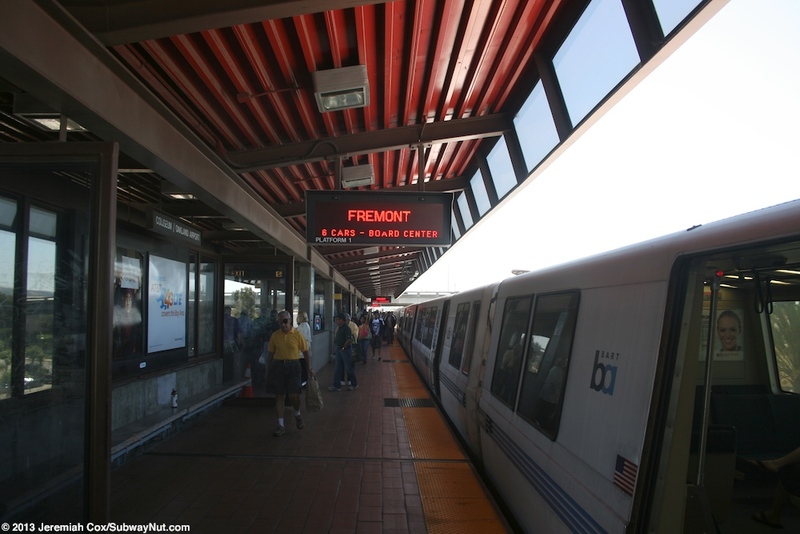 It still feels like its original 1970s design except new black format signs and green signs for the exits have been appearing to provide better graphic information to BART, Amtrak and the AC Transit/AirBART connections. 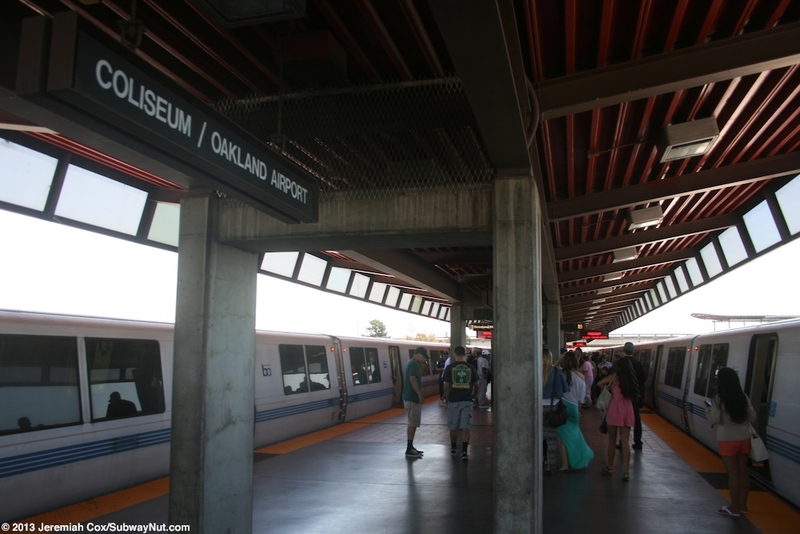 I assume additional platform renovations will occur before the OAK Airport Connector opens to provide passengers with at least a sheltered walk along the platform from the new entrance being built at the platform's southern end. 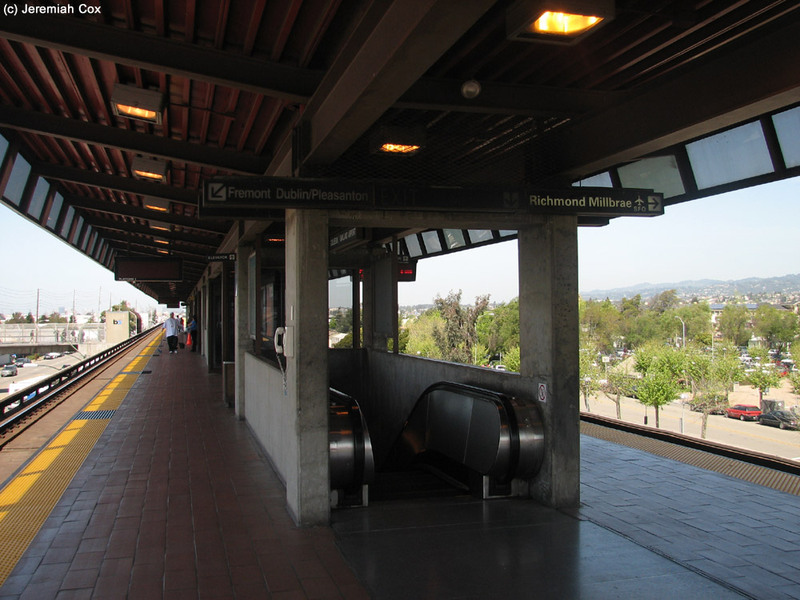 To leave the platform staircases, and escalators lead down to a ground-level fare control area. 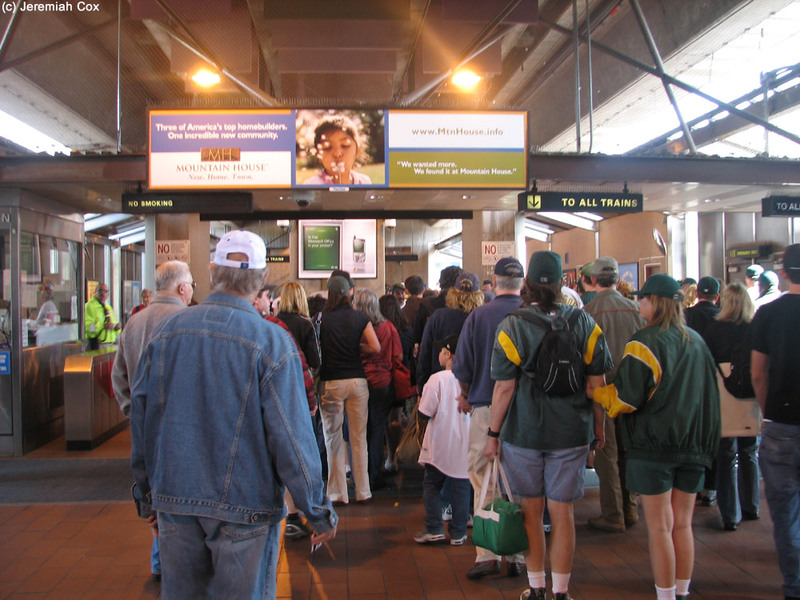 Here are the fare gates and plenty of TVMs. 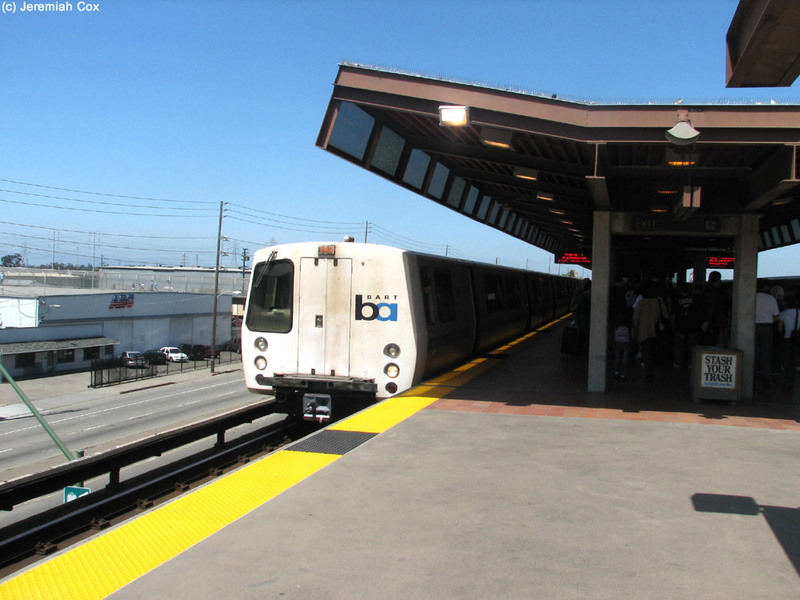 The platform elevator isn't within the valid fare area and those passengers must use a special ADA Process Entry and Exit Ticket (basically the sides of a ticket fare gate without any arms) for initial fare payment or to calculate the correct charge. 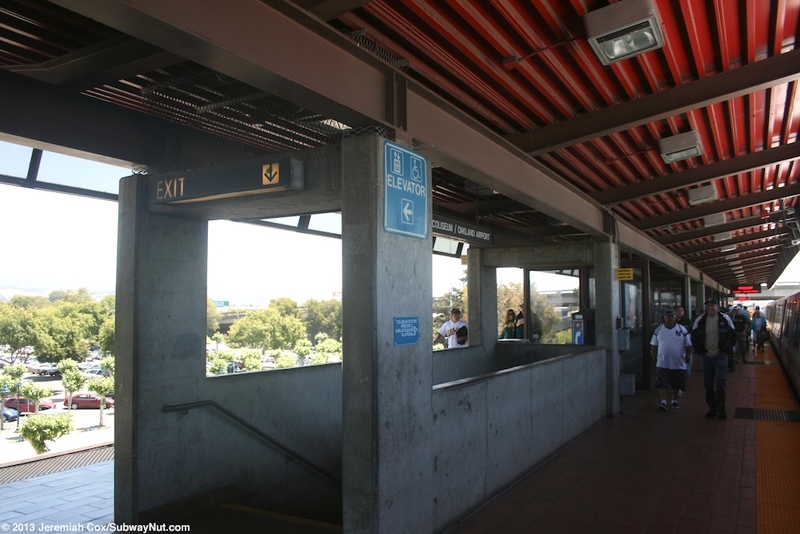 After leaving the station's one exit there are basically three exits and connections. 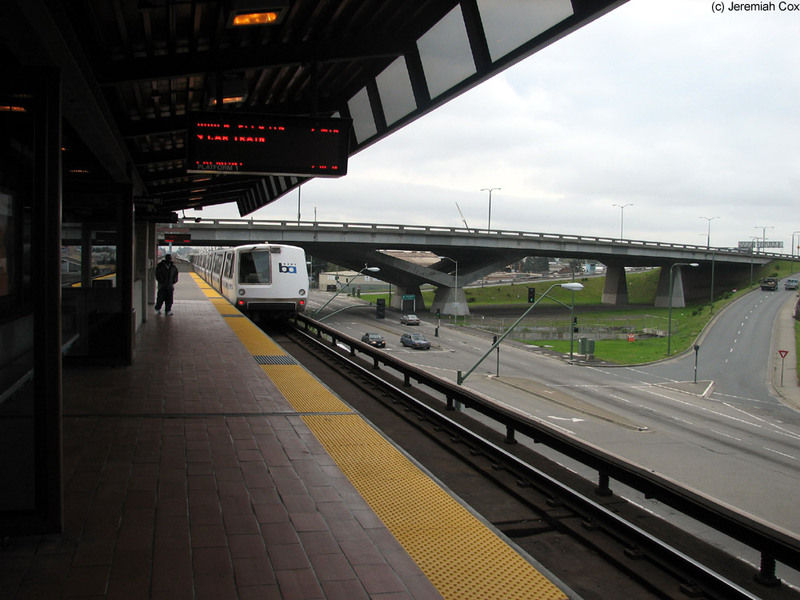 Alongside the fare control area under the elevated structure is the east side of San Leandro Street. 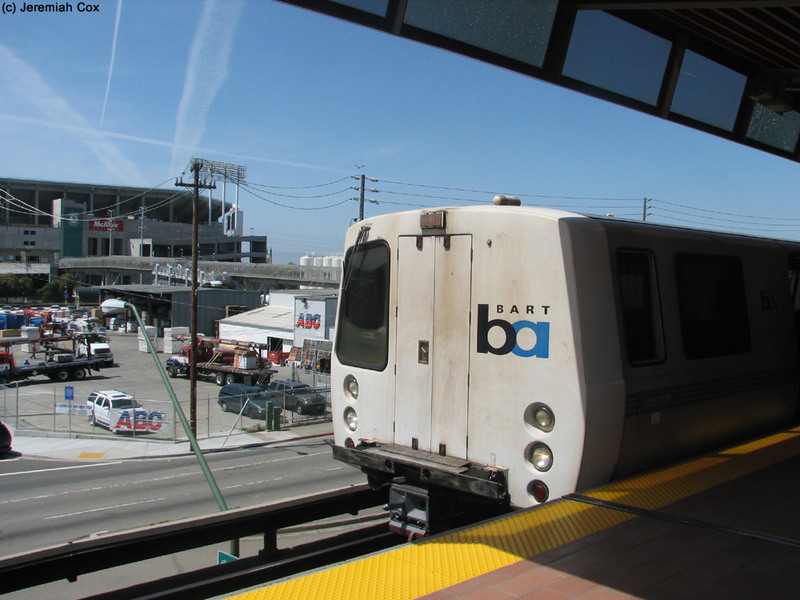 This has bus stops: first the AirBART Stop with blue canopy structures that have yellow bases and is the AirBART branding, this is followed by stops for AC Transit (including local route 73). 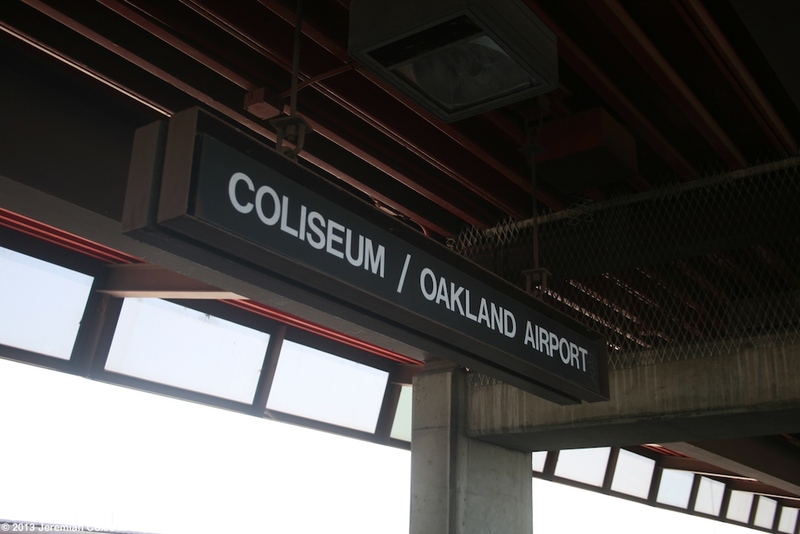 An escalator and wide staircase lead to an intermediate landing before turing and continuing up to the Coliseum Bridge. A second elevator leads directly from the street up to the bridge. 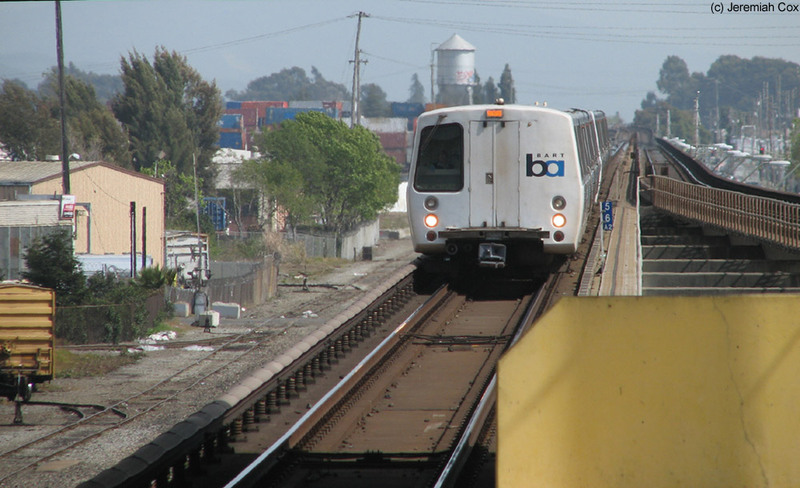 This bridge leads across to the Oakland Coliseum crossing San Leandro Street and has intermediate exits first to the west side of the street followed by the entrance to the Amtrak Capital Corridor Station (that has BART Black signs at its entrance). 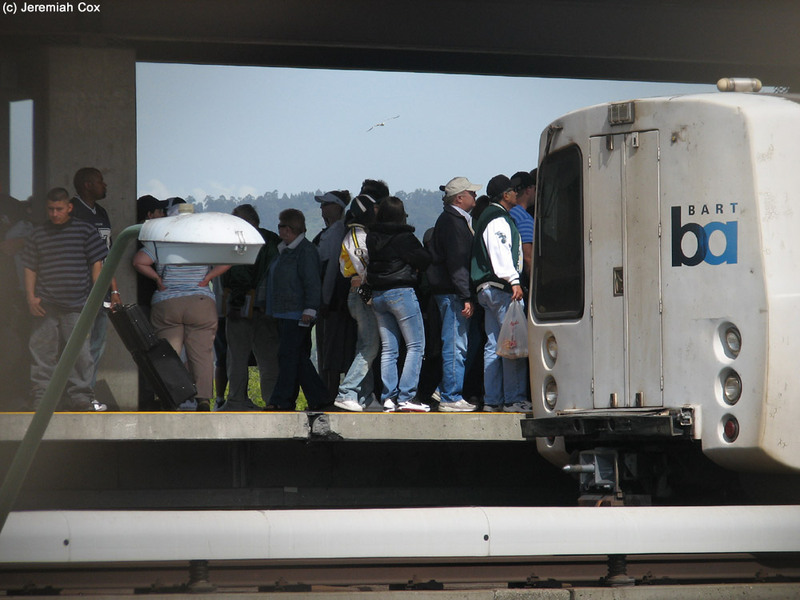 Finally steps lead down to a tunnel under the freight track that is parallel to the east side of BART here. 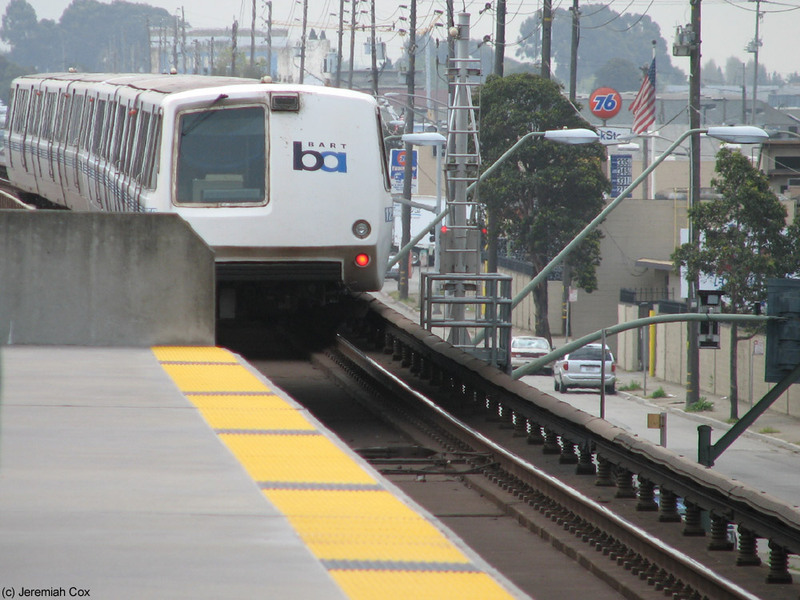 This tunnel has a Wheelchair lift installed along the steps for ADA access. It has yellow and orange walls (the colors of the 1970s). There is first an intermediate staircase with an odd skylight that illuminates the US flag and two California State flags oddly hanging beneath the skylight. The staircase is surrounded by concrete and leads up to the west side of Snell Street. The tunnel continues under Snell street to a wider plaza on the opposite side of Snell Street. 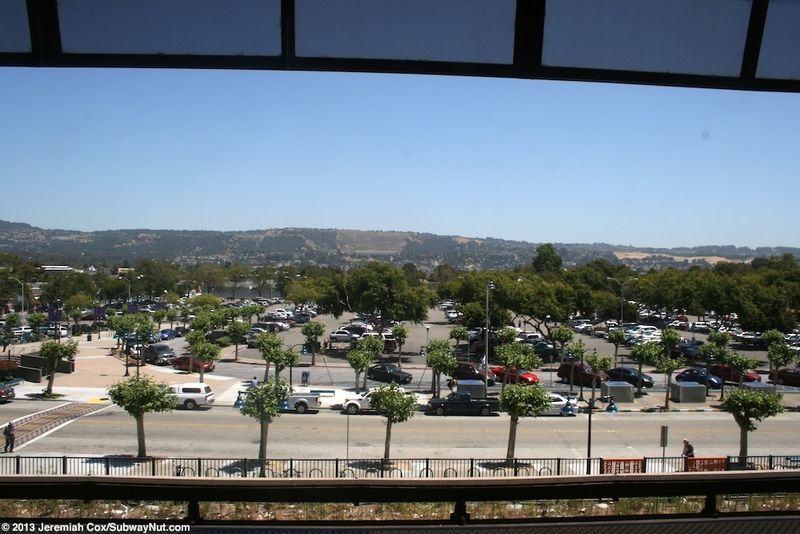 This plaza is on the edge of the station's 1,013 space BART parking lot (some spaces are across 71 Avenue) that extend all the way to Hawley Street and doesn't charge for Parking. 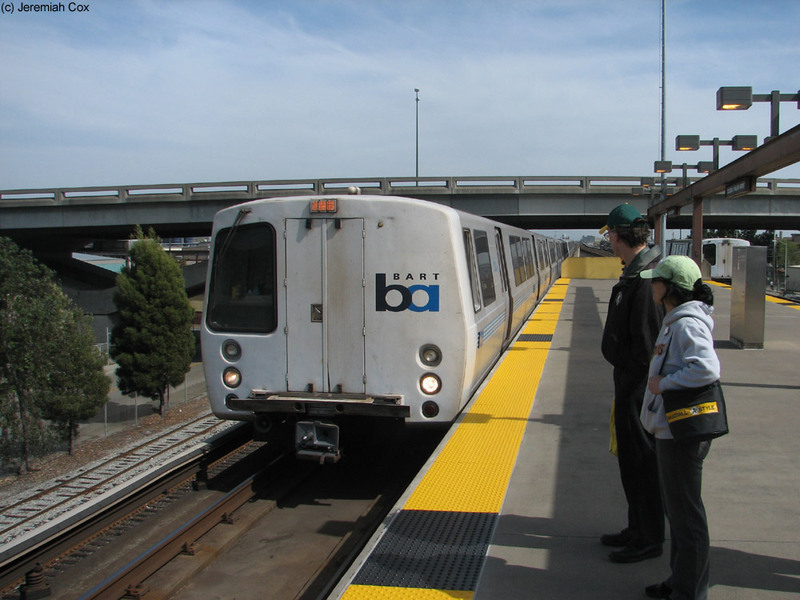 Passengers parking do have to enter their space number in a machine after going to the Fare Gates to keep passengers accessing the Coliseum from using the BART parking lot. 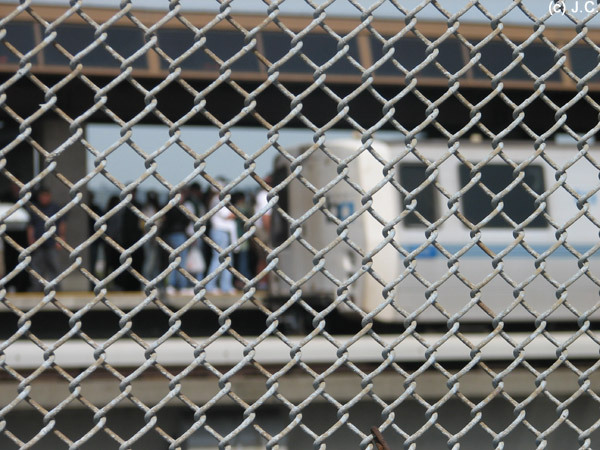 A train in the Coliseum Station viewed through the chain link fence, on the bridge from the Coliseum.